If your kids are anything like mine, Christmas officially starts on the day after Thanksgiving. That’s an awfully long time to be “celebrating” Christmas (i.e., making lists of things they want from the Sunday toy circulars). If you’re trying to keep everyone’s holiday spirit high but not lose your mind answering questions like HOW MANY DAYS UNTIL SANTA COMES?!? an Advent calendar may be exactly what you need. Advent calendars were originally used by German Lutherans in the 19th century to count the days of Advent, which is the time of preparation for the birth of the baby Jesus. These days, though, most Advent calendars start on December 1 and count down to Christmas Eve. You can buy various types of Advent calendars, everything from simple paper options with little doors that open each day to seasonal LEGO sets — or you can make your own, which burns daylight and distracts your kids from thinking of more things Santa can bring them. Speaking of making things and burning daylight, Thanksgiving weekend is a great time to put your Advent calendar together. Your kids are home, they’re probably bored, and you’ll have five weeks to display your craft before everyone is over it. Flower pot calendar. T his flower pot and frame version (left) from the Crafty Chica would be fun and easy to do with kids. She painted a shadow box frame and 24 small terra cotta flower pots. Glue the pots inside the frame, fill with little treats, coupons and baubles, and seal with numbered craft paper. If the pots seem too fragile, you could do the same thing with these watchmaker cases, fitting the fronts with numbers printed on label stock from your computer. You can hang the finished product from a wall or lay it flat on a table. Advent magnets. If you’re short on space, a simple magnetic calendar for the fridge is a nice option. Sheri Landry at This Bird’s Day made a really simple one, using magnetic spice canisters and leftover wrapping paper. She replaced the lid liners of the canisters with festive paper, filled them with treats and hung them on the side of the fridge. Super cute and super easy. Matchbox chest of drawers. This matchbook calendar (right) from Martha Stewart looks like it would be a little more time consuming, but it’s so lovely. You glue two dozen matchboxes together to make a little chest of drawers. On one side, you number the drawers; on the other, you paint a Christmas tree (or star or whatever you like). Each day you take the treat from the numbered drawer and turn the drawer around to reveal the design on the other side. Lovely. This would be a good craft for older kids, since it requires some patience and attention to detail. 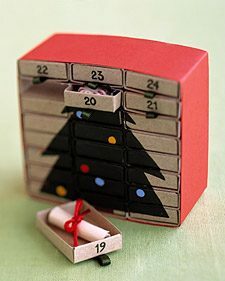 Martha has quite a few great DIY Advent calendar ideas (surprise surprise!). My favorites are this cool wall display and this photo chain calendar, which would be perfect for far away grandparents or friends. Advent calendars from my youth were always filled with candy. Usually chalky little pieces of chocolate that were always kind of a disappointment, honestly. Instead of cheap chocolates, what about filling your calendar with ideas for family activities? Kiddley has an excellent list of activities you can do with your kids as you count down to Christmas. They’re all easy things to do — make hot chocolate, dress up for dinner, write letters to Santa. Write each activity on a slip of paper and put it into a matchbox. Wrap the matchboxes in pretty paper, number the boxes and pile them in a beautiful bowl. This makes a nice centerpiece or accent on a hall table. I really like this idea. Because we all know kids don’t need more candy but almost all families need more fun time together. And this might distract your kids from asking again how many days until Santa comes. Do your family have an Advent calendar tradition? I’m going to make one with a more modern, abstract tree, I think. 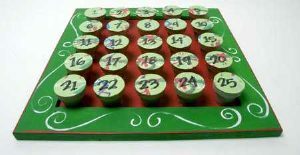 You can find Teresa McFayden’s tutorial here – http://whipup.net/2006/11/17/nifty-advent-calendar/. We used to make paper chains with an activity written on each link to count down the days to Christmas. 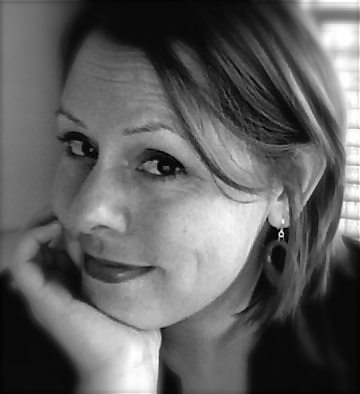 Melissa – these are great! Did you find any more activities that you could list? I like Kiddley’s, but was wondering if you knew of others? I LOVE you. Thank you. I have ben desperatly looking for something as a thanksgivng hostess gift and the kiddley advent will be pefect. I am canging a few to work with the MI cold, as in there will be no picnicing on the beach. Thank you. I have been saved from hours of stressful brainstorming. we did the empty match box version last year and it was great. Thanks for the Kiddley link. Finding the activities was the hardest part! I love this photo advent calendar. I’m hoping to put pictures of all of the cousins in the windows and send it out after the long weekend.